ARDEX FLEXBONE® HEAT is an electrical in-floor heating system for use with tile or stone. The unique crossbones pattern provides less touch points between the cables and the membrane, and less air space within the mat structure, providing faster and more efficient heating of the floor covering. The unique design also allows for easy prefilling in just one pass with ARDEX high-performance mortars, or approved ARDEX Self-Leveling Underlayments can be used for easier, faster prefilling to fully encase the heat cables. ARDEX FLEXBONE® HEAT can be used as a waterproofing layer in bathrooms and other wet areas. Ideal for large-format tile and stone installations, ARDEX FLEXBONE® HEAT is also an uncoupling membrane that helps to prevent grout joint and tile damage from underlying substrate movements. Minimal roll memory – rolls out flat every time! 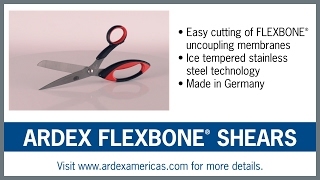 Please click here to learn all about the ARDEX FLEXBONE HEAT System Warranty. To qualify for the Warranty, please submit a completed copy of the Installation Worksheet and Warranty Validation Form via email or mailed in copy. *Form is available in the Downloads section of this page along with complete details on how to submit for warranty submission.